Technical support requests for Customers without Maintenance subscription will be handled through the Black Ice Forum. In version 13.05 of the Black Ice ColorPlus and PDF printer drivers, the PDF output has been improved for fonts with Unicode font names. Previously e.g. on Chinese operating systems, if a font was being used in the document with Unicode font name (like ) the printer driver could not find the proper font file, and as a result the output PDF was incorrect. From version 13.05 onwards the printer driver will be able to find the English name of the font, in this case, for the font (on the Chinese Windows) the printer driver will now use the SimSun font name, and the output PDF will be generated correctly. 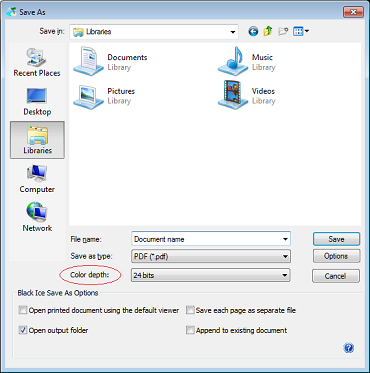 When the ‘Enable Save As’ option is selected, the Save As dialog will be displayed each time before saving a file. With version 13.05 of the Black Ice Printer Drivers, the color depth settings can be specified as well on the Save As dialog. The values can be: 1 bit (monochrome, black and white), 8 bits (256 colors), 8 bits grayscale (256 shades of grey) and	24 bits (16 million colors). Please note that certain file formats do not support all the available color depth options. The Photo Quality option improved in the ColorPlus, Color, PDF and Monochrome printer drivers. When Photo Quality is enabled, five high quality filters become accessible. Digital half-toning, also referred to as spatial dithering, produces the illusion of continuous-tone pictures on media that is only capable of displaying binary picture elements, for example: fax machines and most printers. Floyd-Steinberg and Jarvis-Judice-Ninke are the text book filters. The Smooth, Sharp, and Stucki filters are less known, but produce better quality output. Floyd-Steinberg is the default setting. 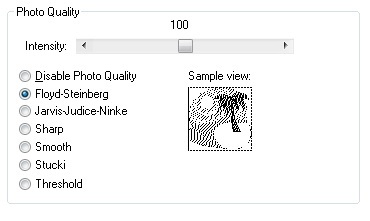 The sample view now shows the selected settings on a test image. 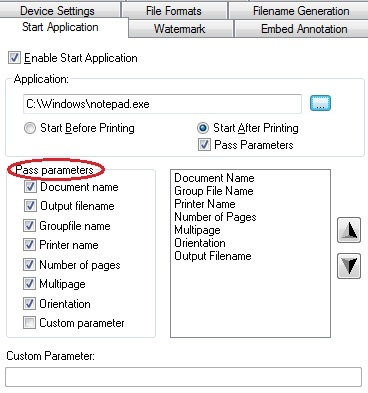 In former versions of Black Ice printer drivers, when using the start application feature, one would have to specify which parameter to remove from the passed parameters list. Many of our customers indicated that they would like this feature to work the other way around. The user should specify what parameter to pass to the application. From version 13.05 onwards, checked parameters will be passed to the start application instead of being removed.